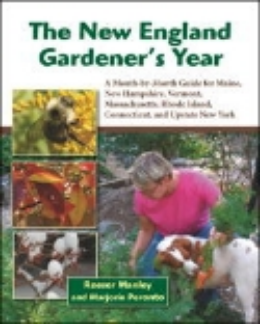 A cross between a helpful how-to manual and a lovely coffee table book, Reeser Manley and Marjorie Peronto’s The New England Gardener’s Year is a month-by-month companion for gardeners in the Northeast. In each month’s chapter, the authors catalog typical activities--pruning berries in March, tending the compost pile in April, planting peas in May—and highlight plants of special interest in any given month, with an emphasis on native species. There are also colorful spreadsheets in each chapter that give even more specific guidance for gardeners in each of the growing zones in the region. Upstate New York is included along with the six New England states. The writing style is conversational and engaging, and the book is full of beautiful photographs, tempting recipes, and tips based on the authors’ own gardening experiences. Near the end of the book, Manley and Peronto chronicle their visits to several New England gardens, in various zones. One of these is the garden of Ron and Jennifer Kujawski in West Stockbridge. WMMGA master gardeners and interns will recall that Ron was an instructor in the fine art of diagnosing plant problems in the 2013 Master Gardening Training Seminar. The book ‘s closing chapter, entitled “The Garden in Winter,” has especially lovely photos and ruminations. While most experienced gardeners probably already have a pretty good sense of what to do when in their neck of the woods, what gardener doesn’t enjoy a companion on the journey through the year, not to mention some reminders, second opinions, and confirmations? The book would also make an especially nice holiday or housewarming gift for a novice gardener or for an experienced gardener who has relocated to New England. The hardback sells for about $35 in bookstores. Reeser Manley has a PhD in Horticultural Science and forty years of gardening experience in Georgia, South Carolina, Washington State, and Massachusetts, as well as in Maine. Marjorie Peronto is an Associate Extension Professor at the University of Maine, where she has taught courses in ornamental gardening, ecological landscaping, and home food production for twenty years.